Last week, after the British House of Commons rejected for a second time the withdrawal agreement and framework for the future relationship negotiated with the European Union and also rejected leaving the EU without a deal, it approved a motion put forward by Prime Minister Theresa May that if the House approved the agreement and framework by Mar. 20 the government would seek an extension of the Article 50 process from Mar. 29 to June 30 in order to pass necessary exit-related legislation, and that, if the House had not passed such a resolution by Mar. 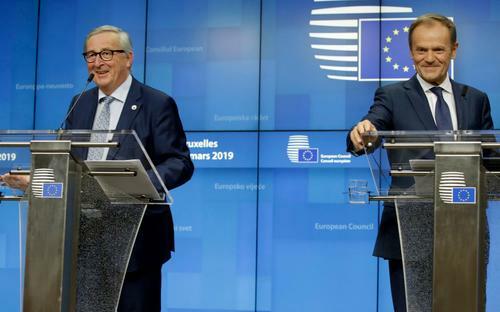 20, it was highly likely the European Council would require a “clear purpose” for a longer extension and would require the UK to hold the European Parliament elections scheduled for May. On Monday, as the prime minister and members of her government continued their efforts to persuade Conservative MPs opposed to the agreement as well as the ten MPs of the Democratic Unionist Party of Northern Ireland to support it in the vote anticipated by Mar. 20, the Speaker of the House, John Bercow, surprised the prime minister and the political world by ruling that the House could not vote again on the agreement since it had not been substantially changed from the agreement rejected last week and, in accordance with long-standing parliamentary convention described in the definitive treatise on parliamentary procedure written by Thomas Erskine May in the 19th century and now in its 24th edition, the same motion can’t be brought forward for consideration a second time in the same parliamentary session. No one in the government and certainly no one in the EU anticipated the speaker’s ruling. One might have imagined that, since the House voted last Thursday by a substantial majority – 412 to 202 – that the government would either seek a short extension to June 30 if the House had approved the agreement by Mar. 20 or, if it had not, would recognize that it was highly likely the European Council would require a “clear purpose” for any longer extension and that any longer extension would require the UK to hold European Parliament elections in May, after last week’s vote rejecting a no-deal exit and the Speaker’s ruling on Monday, the government would have requested an extension for a “clear purpose” such as reconsideration of the future relationship. But that didn’t happen. Instead, after a cabinet meeting Tuesday morning that some described as “stormy,” the government opted for something else – another vote on the agreement and, assuming the speaker allows one and the agreement is approved, a short “technical” extension to June 30. On Wednesday, the prime minister wrote to Donald Tusk, the president of the European Council, and requested that it approve the supplementary documents she and Commission President Jean-Claude Juncker agreed in Strasbourg on Mar. 11, on the eve of last week’s vote on the agreement, so the government could take those documents and the Council’s approval to the House and confirm changes in its proposition, thereby enabling it to bring forward another motion next week to approve the agreement and declaration. The Strasbourg documents, of course, are the legally-binding Joint Instrument conveying the EU’s and UK’s shared understanding of the withdrawal agreement and the supplement to the Political Declaration on the framework for the future relationship. Those documents were known prior to last week’s vote; the only thing different would be the European Council’s formal approval of the documents. Whether the speaker decides that substantially changes the government’s proposition remains to be seen. But assuming he does and the motion is then approved, the prime minister said the government will need additional time beyond Mar. 29 to enact the legislative measures required by the withdrawal agreement and therefore requested an extension of the Article 50 period to June 30. That the government opted, notwithstanding the speaker’s ruling, for a third vote, rather than asking for a longer extension for a “clear purpose,” reflected the fact that, although last Thursday’s motion was put forward by the prime minister, a large number of ministers were opposed to an extension, especially one that went beyond June 30 for some as-yet-undefined purpose and would require the UK to participate, three years after the Brexit referendum, in the European Parliament elections. Indeed, a substantial majority of Conservative MPs, including a number of ministers, voted against that motion. While 112 Conservative MPs voted for it, 188 voted against it, including eight members of the cabinet – among them Andrea Leadsom, the Leader of the House; Stephen Barclay, the Secretary of State for Exiting the EU; Liam Fox, the Secretary of State for International Trade; Penny Mordaunt, the Secretary of State for International Development; and Chris Grayling, the Secretary of State for Transport. In an unambiguous signal to Conservative backbenchers that they could vote against the prime minister’s motion, Sir Graham Brady, the chair of the party’s influential 1922 Committee, also voted against it, as did the 10 DUP MPs. The prime minister’s motion passed not because of Tory support but because the other parties in the House voted overwhelmingly in favor. In a statement Wednesday afternoon after receiving the prime minister’s letter, Tusk said that, based on his consultations with various leaders, he believed a short extension would be possible. But importantly, he said the extension “will be conditional on a positive vote on the Withdrawal Agreement in the House of Commons.” As to its length, he said that, while the prime minister’s proposal of June 30 has its merits, it created a series of questions of a legal and political nature which the leaders would discuss at yesterday’s meeting. In regard to approval of the Strasbourg agreement, he said he thought that would be possible and, in his view, didn’t create risks – especially since it might help the ratification process in the UK. Yesterday, the European Council, meeting in its Article 50 form without Prime Minister May, approved the joint instrument relating to the withdrawal agreement and the joint declaration supplementing the political declaration agreed by the Commission and the UK at Strasbourg on Mar. 11 and agreed that, if the withdrawal agreement is approved by the House of Commons next week, the exit date will be extended to May 22, the day before the UK would otherwise vote in the European Parliament elections. If the withdrawal agreement is not approved by the House next week, the exit date will be extended, but only to April 12, the date by which the UK must decide whether it will hold the European Parliament elections, and with the expectation that the UK will by then indicate a way forward – a no-deal exit, revocation of its Article 50 notification, or a long extension – for consideration by the European Council. If the UK does not decide to participate in the European Parliament elections by April 12, it will no longer have the option of a long extension. It is an elegant solution to an exceptionally complex problem, one that, as Tusk said in his press conference with Juncker after the meeting, leaves all options – approval or rejection of the withdrawal agreement and, if rejection, a no-deal exit, a revocation of the Article 50 notification, or a long extension – on the table. The UK now has to do what it thus far has been unable to do – decide what it wants.